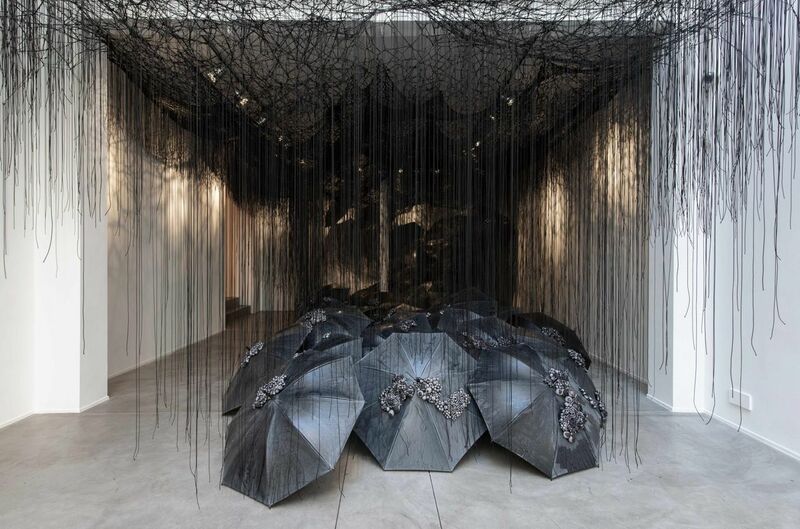 On the eve of Art Brussels, artist Chiharu Shiota will be unveiling a new installation, Black Rain, at Galerie Templon in Brussels. This immersive work with its spectacular setting of black umbrellas was created as a reaction to drastic experiences in the artist’s life. The artist explains: “A storm appears on the horizon, the clouds grow darker and darker. This is not a light drizzle, cleaning the air giving life to earth, this is a natural catastrophe, threatening my existence. The black sky absorbs all light, all life. Underneath the umbrella, the sound of the rain grows louder and louder. It is deafening. The rain has turned black, my emotions have become dull, my existence is uncertain.